"I began my service at the monastery as the gardener... Unfortunately, the Prophets did not allow me that peaceful life." Each of your other personnel present is Integrity +1 (or +2 while facing a dilemma). Characteristics: affiliation, Vedek, Bajoran species. 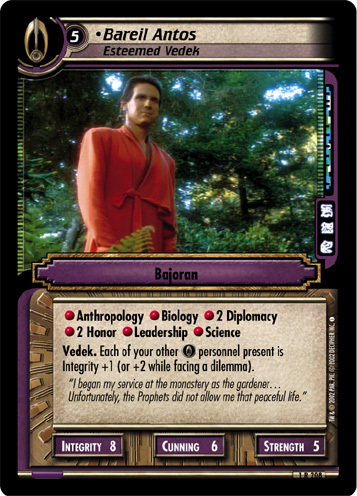 "Bareil Antos, Esteemed Vedek" is a backward compatible card form the Second Edition expansion Second Edition - ST1E compatible (Copyright 2002 by Decipher). See collectors infos for this card in the Second Edition section under the UCT-ID: ST2E 1 R 208. Also see here for all trade lists with any card fom "Second Edition - ST1E compatible".